On July 16, 2016 former world No. 1’s Justine Henin and Marat Safin received the highest honor in tennis – induction into the International Tennis Hall of Fame. 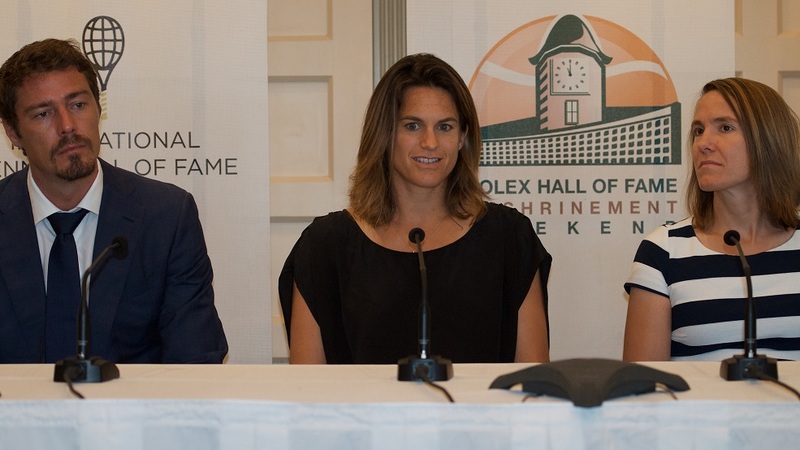 In addition, Class of 2015 inductee Amelie Mauresmo was honored in the induction ceremony, as she missed last year’s due to the birth of her child. Master Players Yvon Petra of France and Peggy Scriven of England were inducted posthumously. The new Hall of Famers were honored in a grand ceremony on Bill Talbert Stadium Court at the International Tennis Hall of Fame in Newport, Rhode Island.In addition to the new honorees, Hall of Famers took part in the ceremony include Jimmy Connors, who introduced Marat Safin, and Monica Seles, who introduced Justine Henin. Belgium’s first ever inductee to the International Tennis Hall of Fame won seven Grand Slam singles titles, including four French Open titles, three of which were consecutive. She won 43 singles titles and won the Olympic Gold Medal in Athens in 2004. Henin was the WTA year-end No. 1 three times. A US Open and Australian Open champion, Marat Safin held the world No. 1 ranking for nine weeks, and was in the world top-five for 119 weeks. Safin won 15 singles titles, including five ATP Masters 1000 tournaments. He was an integral member of the Russian Davis Cup team for 11 years, and was a member of two championship teams. Yvon Petra was a notable French tennis player of the 1940s. His career success came at a challenging time, straddling World War II and its interruptions to the French Championships. Petra won the Wimbledon singles title in 1946, ending a 19-year drought of French victors and making him the last French man to have done so. Perhaps most notably, his historic Wimbledon victory came following five years as a prisoner of war in Germany. Margaret Scriven of Yorkshire, England, accomplished the rare feat of back-to-back French Championships titles. She was the first British woman and only unseeded player ever to win the French National Championships, which she did in 1933. She successfully defended her title the following year, making her the last British woman to win the same major tournament for two consecutive years. A skilled clay court player, Scriven also won a mixed doubles and doubles title at the French Nationals. Amelie Mauresmo has been a Hall of Famer for a year already, but she missed last year’s ceremony for a very good reason – the birth of her son! In 2004, Mauresmo became the first French woman in history to climb to the top of the world rankings, reaching the semifinals at Wimbledon and the quarterfinals at the Australian, French, and US Open. In a banner year, Mauresmo won both the 2006 Australian Open and Wimbledon.